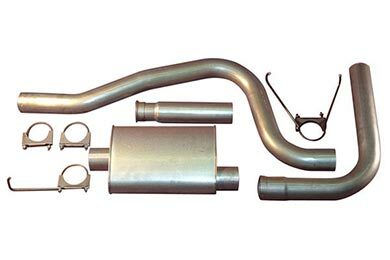 Read 247 customer reviews about Heartthrob Exhaust, Mufflers & Tips that have an average rating of 4.5 to find out what product is best for your vehicle. Installation was difficult. Took about 4 hours. Pipe was 3.5 inches too long. Had to be cut to fit correctly for the Jeep. Only one of the two mounting brackets fit the Jeep. After installation, great product. Nice low growl to the 4.0L Grand Cherokee. Great price from AutoAnything. Took about 4 weeks to recieve product because it is custom made. Well worth the wait. Great Product for the money. I just recently purchased this kit for my f-350 with the 5.8, and am extremely pleased with it. Installation was very easy and straight forward and only took a matter of a few hours (to get everything perfect). I only needed to drill one hole, but that was my choice, as I wanted a hanger right off of the back of the catalytic converter. The exhaust has a very deep tone and that mean cackle as well, and surprisingly is not that loud! Absolutely no interior drone either. 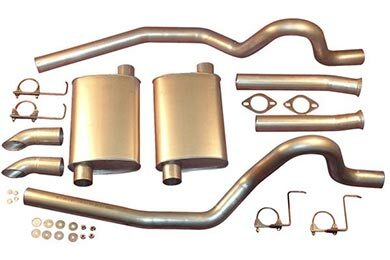 Great kit, I would recommend it to anyone looking for the baddest sounding vehicle in town! I got the kit on a Friday night after work and had it on within three hours, was really straight forward and easy!!! I did have to make a few extra cuts though so the tail pipes looked right on my 2005 F 150.. But in all i am very happy with the kit sounds great looks awesome and the increase in horespower and gas mileage are a big plus!!! Now it will be on to a cold air induction kit!!!! Thanks auto everything and thanks heart throb for bringing such a great product!!! 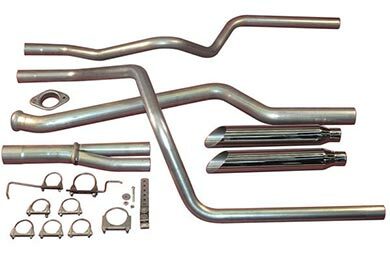 I have been looking for a stock dual exhaust system for a project truck my son and I have been building. 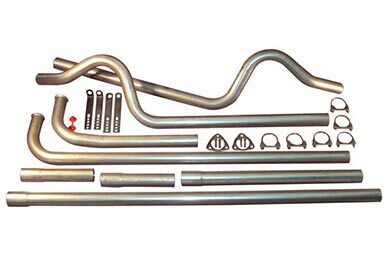 This system fit very well especially around trailing arms, a well designed system. We went with the glass pack mufflers, great sound. The one problem I had was our truck is a short bed and the system was designed for a long bed. We had to make 3 easy cuts and then the system fit perfect. Reference # 766-179-341 © 2000-2019 AutoAnything, Inc.